RIV is a great community of girls, who have a great passion, and men who are looking for it and ready to pay good for the pleasure they receive. And since the beginning RIV was an amateur community. Any man can be really turned-up when seeing a beautiful hot girl, which is real and may even live the next door to him. However the amateur approach has it drawbacks. The absolute majority of RIV girls do not bother about the "quality" of their video. They simply take a notebook with a built-in webcam, sit in darkened room and start working on RIV. As a result a man sees a girl whose beauty is hidden behind the blurred, wrong colored picture full of artifacts. The video becomes even worse when the girl's computer is using a low-speed internet connection. But fear not! There are just four small steps which can help to GREATLY improve the quality of your video thus increase the number of clients and your overall revenue. As it already was stated above the majority of RIV girls are using the notebooks with built-in webcams, which is OK for occasional skype conversations with mom, but for webcam video chat it is BAD! The first thing you should do is to go to the nearest hardware shop and buy an external web-camera. Not necessary a high-class web-camera. It can be a medium-priced solid product capable to capture the HD 720p video like Logitech HD Webcam C525. After doing this you should already notice a major improvement of your picture. 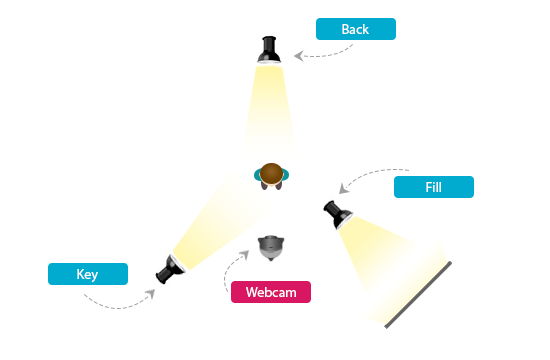 Even with a good web-camera the presentation of your video stream can be heavily crippled if the lighting of your room is not setup properly. For the best result you will need three light sources. A lamp a reflector is recommended. You may have one clamped on your headboard for reading at night. Stay away from "soft lights" and "colored lights", and BY NO MEANS USE FLUORESCENT. Set up your first light and put it in front of the you (slightly to one side) and high as possible at a 45 degree angle looking down. See the diagram below. This is the KEY or MAIN light. You are now lit. But you still seem to have heavy shadows on the opposite side of your face. Set another light making this one more diffuse by reflecting it off a wall, a reflector or by putting a scrim (basically a grille) in front of it. This is the FILL light and helps soften the shadows See the diagram above and note the light is not aimed directly at you. You can also add a light above and behind you to add a slight corona (i.e. white line) around you that helps to separate you from the background. This is called the BACK light. Usually an existing overhead or table lamp will be adequate unless it is fluorescent. To have the KEY light too close. To not reflect the FILL light. To have too close or too bright a BACK light. If you're working during daylight hours and can use sunlight from a window, by all means use it. Sunlight is the most user friendly light source available. Having two first steps completed you will guarantee that your picture is almost perfect and the next goal is to smoothly deliver your video to the watcher. And you should remember that ONLY the upload speed is important for transmission of the video. If the upload speed is low the watcher will see your video interrupted and even as slide-show in some cases. The problem is that Internet Service Providers often use ADSL technology for connecting your computer to Internet and ADSL connection has great download speed, but very low upload speed. For general web surfing purposes it is OK, but for video transmitting is unacceptable. Please click the button below to evaluate the quality of your connection. If it tells you that upload speed is unacceptable we STRONGLY recommend to contact your IPS and ask for a possibility to improve the upload speed of your internet connection. Many RIV girls do not understand the utility of RIV HD Plugin and continue to show their video in standard 320x240 resolution using the default video encoder built-in to Flash Palyer. The thing is that RIV Plugin in HD allows you to transmit 640x480 high quality video and audio using the same bandwidth as the 320x240 video stream encoded by Flash Player. Moreover the 320x240 video stream in "low" quality encoded by RIV Plugin in HD uses 2 time less bandwidth than the the 320x240 video stream encoded by Flash Player while having a much better quality of both picture and audio. This can greatly improve the video of those girls, who have a low upload speed. Please read the RIV Plugin in HD installation guide and if your computer matches the minim system requirements described in the guide, install the plug-in ASAP. Thank you very much for ready this guide! If you complete all the steps described above the quality of your video will be as good as if you worked from professional studio and of course you will notice the increase of you revenue very soon. If you are having any problems or with any of the steps please do not hesitate to contact us!